In 1650s England, a young Puritan maiden is on a mission to save the baby of her newly widowed preacher–whether her assistance is wanted or not. Always ready to help those in need, Elizabeth ignores John’s protests of her aid. She’s even willing to risk her lone marriage prospect to help the little family. Yet Elizabeth’s new role as nanny takes a dangerous turn when John’s boldness from the pulpit makes him a target of political and religious leaders. As the preacher’s enemies become desperate to silence him, they draw Elizabeth into a deadly web of deception. Finding herself in more danger than she ever bargained for, she’s more determined than ever to save the child–and man–she’s come to love. 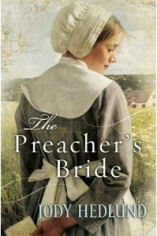 If you would like to read the first chapter of The Preacher’s Bride, go HERE. I will be completely honest with this book. I had a hard time, in the very beginning, getting into the book as, to me, it was just a little bit slow. But after the first few chapters, I was HOOKED!! This story is about a young woman,Elizabeth, who steps into the role of caring for a widowed preacher’s baby. She feels called by God to be the caregiver, but what of falling in love? What of the problems that arise when Elizabeth falls in love with John Bunyan? Elizabeth’s character is created beautifully, including the flaws, and she really captured my heart when I got hooked on the story. I really wanted to hug her so many times for her heroic efforts of being a “mom” to the baby! This particular novel is both informative and historical. I haven’t really read any novels that centered around the Puritans and this one was very intriguing! I love the historical era of the 1600’s in England. I could just see the towns and the townspeople of that era come to life! It was also an era of town gossip and oh what gossip there was when Elizabeth stood her ground and didn’t succumb to the gossip. She was very strong for that part. Jody Hedlund definitely has a new fan in me. She took a historical person’s (John Bunyan) life, researched it, and created a fantastic novel that is sure to win the hearts of many a reader! This 5 star novel is worth the slow start, because once you get past that ( and you may find it’s not so slow for you!) this book will have you feeling the happiness, the sadness and the struggles that this sweet woman, Elizabeth, and the amazing characters beyond her, all felt. Definitely a book that I recommend to many readers! Well done, Jody.